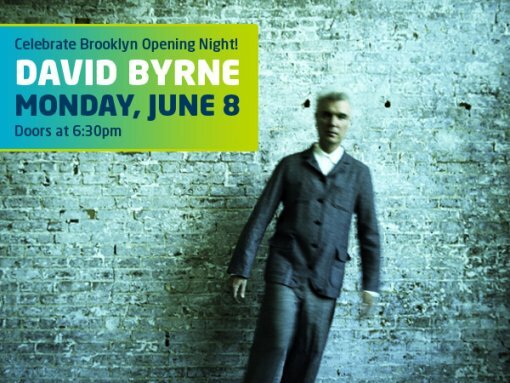 The big news out of the Borough of Kings today is that David Byrne will kick off the opening night festivities at Celebrate Brooklyn! this year with a free* performance at the Prospect Park bandshell on June 8, 2009. In other CB news, Animal Collective, whose August 14 show at the bandshell has been selling well, have added a second benefit performance on August 15. Tickets for that show go on sale April 8, 2009 (today) at noon. I gotta say, with Bob Dylan last year and David Byrne last year, the folks at Celebrate Brooklyn! have really landed some impressively big fish two years in a row (then there was that Prince thing 3 years ago, but I digress). The rest of the lineup is set to be announced on May 4, 2009. Until then, you can take a look at my unofficial Celebrate Brooklyn! schedule below. More info on the opening night gala after the jump. BRIC Arts|Media|Bklyn invites you to attend The Celebrate Brooklyn! Opening Night Green Gala & Concert that will kick off our 2009 season of free performances at the Prospect Park Bandshell. Co-founder of the influential and widely acclaimed Talking Heads (1976-88), David Byrne has taken popular music in new directions, and introduced an innovative visual approach to the genre. Currently on a year-long tour performing the Music of David Byrne and Brian Eno, the show celebrates the composer and producer’s ground-breaking 30-year partnership. This tour stop will open the Celebrate Brooklyn! season with an unprecedented free concert as part of our Gala evening. The Green Gala will be an exciting eco-friendly evening with a zero waste goal that launches other green initiatives including cycling and recycling efforts to reduce the Festival’s environmental impact and to promote eco-friendly practices. All proceeds from the gala provide vital funds for Celebrate Brooklyn’s free programming and will also support our green initiatives.